It’s always great seeing Dr Pokriefka. She shows so much patience for my son. Her staff is always so friendly aswell. It’s always great seeing Dr Pokriefka. She shows so much patience for my son. Her staff is always so friendly as well. We love Dr. P. She is nothing short of professionalism and bedside manner. She always answers any and all questions mydaughter and/ or I may have during our visit... or after. We love Dr. P. She is nothing short of professionalism and bedside manner. She always answers any and all questions my daughter and/ or I may have during our visit... orafter. **Please type your NAME exactly as it appears on your insurance card when booking your appointment. If you are an established patient at this office and need to book an annual physical, please call the office directly to ensure the provider allows proper time to meet your wellness needs. Dr. Pokriefka requests that all new patients arrive at the office 30 minutes before their scheduled appointment times. 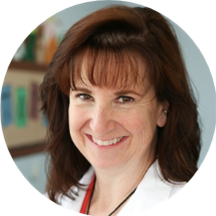 Eileen Pokriefka is a caring and friendly pediatrician. Dr. Pokriefka attended Michigan State University in East Lansing, where she received her medical degree. She completed her internship at Mount Clemens General Hospital and a residency in pediatrics at St. John Hospital in Detroit. Dr. Pokriefka is certified by the American Osteopathic Board of Pediatrics. She is a member of the American Osteopathic Association, the American College of Osteopathic Pediatricians and the American Academy of Pediatrics. Dr. Pokreifka is the Chairperson of the Pediatric Department of McLaren Macomb Hospital. Patients see Dr. Pokriefka for a variety of reasons, including well child visits, sports physicals, and sick child visits. Dr. Pokriefka is sensitive to the uniqueness of each patient's situation and adapts her office visits and treatment options appropriately to accommodate individual needs and concerns. We LOVE Dr. P. She is never anything short of thorough. She always answers my questions and gives advice and/ or tips on how to treat the virus. My daughter had two trips to urgent care the week prior to ourappointment and she made a point to call the clinic and ask for test results. Dr. P. is GREAT! I took all of my paperwork with me for her to sign and review before school starts. She was able to help explain all of the details from our trip to the allergist the day before. We just love her!! We couldn’t ask for a better doctor or staff! Great experience always! Our son looks forward to seeing Dr Pokriefka and her staff! Thank you! Dr. P. is always fabulous with my girl and knows her well enough to know when she is miserable (with seasonal allergies) or really sick. Dr. P. has been our pediatrician since my daughter was two (she's on the verge of 11 now). She is always very thorough with her answers, never seems bothered or annoyed with our questions, takes her time and never makes usfeel rushed in our visit. She always gives us great advice (when medicine is not needed) and we feel as though she truly cares. She is very thorough and patient with us. Willing to answer any questions. She makes you feel as if you are her only patient, though she has a full schedule. She is a very caring doctor and is great with infants. She is very thorough. Excellent! We couldn’t ask for a better pediatrician! Dr. Pokriefka is always very kind and professional. It’s nice to have a doctor who genuinely cares and doesn’t treat her patients like they’re just a number. I would highly recommend her to anyone! I really appreciated all of the tips and remedies to give to my 9-yo girl as she deals with a very, very bad cold. Got there and hour early and we didn't leave till 4:30. Staff and doctor were very nice and had smiles. Another thing I didn't like was when you leave the office you walk through the sick side and could run the risk of becoming sick yourself. I was contacted by the office before we went to the appointment, they stated Caitlin had never been there before. She has been seen at least 3 times. Maybe it's time to find a new doctor. We have been seeing Dr. Pokriefka since my daughter was 7 (she's 9.5 now). She has always been GREAT!! Always a good experience seeing Dr. P.
Was removed as their patient and the office never let me know until I called to make an appointment for my kids. I always appreciate Dr. Pokriefka seeing my child. She's a wonderful physician. I wish I could take her with me when we move!!!! This was one of the few days when our wait time was much longer than usual; however, it was okay because we really enjoy and like Dr. Pokriefka. It's always nice to see Dr Pokriefka. She has so much patience and is just awesome! As usual I love her, she is always so warm and patient. Soft spoken and informative if I need her to be. Since coming to MI, I have had the pleasure of going to see Doctor Pokriefka. She is so good with my son who was born at 25 weeks. She has wonderful bedside manner and is very interested in what I have to say when it comes to his needs. Dr. P is awesome. She spends a few minutes just talking to your child before even starting any exam so that they feel comfortable. And she's great with kids. She also will spend as much time as you need answering the questions you have. I've always loved Dr. P, she's amazing and know both my kids as individuals not just a patient. She is a wonderful and friendly doctor! We love dr. P. She is always looking out for the best interest of my kids. We've Been going here since my kids have been born. We love Dr. Pokriefka she is awesome. I'd. Recommend her to everyone. She's an amazing doctor - and really good with the kids! I absolutely love my son's doctors office. I am there enough that they feel like family. I couldn't ask for a better doctor than Eileen Pokriefka. In and out. They can always thank goodness fit me in when the kids are really sick :-) Dr P is great! Dr. P has been been my children's doctor for the last 18 years. She is wonderful. I love her, she really makes me feel like my kids arête only patients she sees because she remembers every detail about each of my kids. She's always so calm and patient, she's just amazing.